Help your friends create impressive proposals that show off their work and deliver results. With our referral program you can earn a $100 USD gift card or a $100 Qwilr credit for every new person you refer who subscribes to a paid plan. Share your referral link. It's that easy. If anyone you've referred signs up to Qwilr and becomes a paying Qwilr customer, we’ll give you the option of either a $100 Amazon gift card or a $100 Qwilr subscription credit. 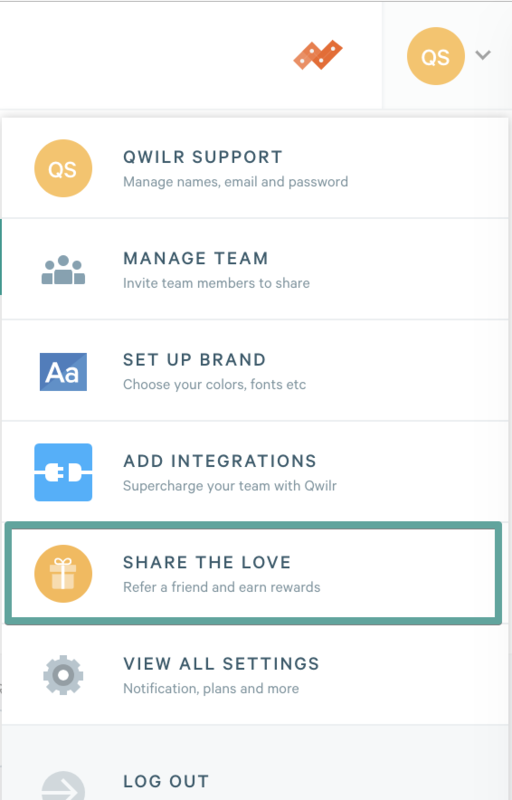 You can find your referral link by going to Settings → Share the Love. Who can I refer to Qwilr? You can refer Qwilr to people who are not currently users or customers of Qwilr. This excludes you (of course) and people who are already using or accessing Qwilr through a separate account or email address. Otherwise, you can refer as many people as you’d like! Where can I share my referral link? You can share your referral link with a friend directly or with your private network through email or social media. We ask that you do not publish the link on public websites, such as coupon / promo code directories. Doing so will mean we'll need to disable your referral link. How do I get and use my gift card? Once a person you’ve referred to Qwilr signs up for a paid subscription, we’ll confirm that the person was in fact referred by you and email you within 14 days. This email give you the option of a gift card or Qwilr credit. I’ve referred someone, so why haven’t I received a gift card? The person has not signed up for a paid Qwilr subscription. The referral reward only applies once the person becomes a customer. The person has become a paying Qwilr customer, but we haven’t yet verified the referral. Assuming everything is fine, you should receive the gift card within 14 days of the person becoming a customer. The person was a Qwilr user or paying customer before clicking on your referral link. We’ve detected suspicious activity with the referral (posting on public sites, for example). If you’re certain none of the above apply, please reach out and we'll take a look. Note: We will deny referrals if we detect or suspect fraudulent behavior.